Don Willott is a member and past president of City of Bainbridge Island’s Non-motorized Transportation Advisory Committee. 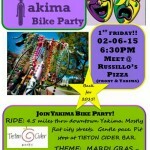 He is also vice president of the North Kitsap Trails Association and chair of its Sound to Olympics Trail Committee. He provides us with this post. 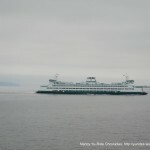 If you ride a bike on Bainbridge Island, you are undoubtedly familiar with the pinch point in the first mile of SR 305 north of the Washington State Ferries terminal. This transportation project is improving the location along the highway north of Vineyard Lane with the addition of a full shoulder, and improves the “pork chop” island at the entrance to Vineyard Lane to allow full shoulder. Paving was done on Thursday, October 2nd, shown in these photos. A section of guard rail and construction of the pork chop island are being installed next. The project was fully funded by City of Bainbridge Island (COBI) City Council as part of the City’s Capitol Improvement Plan. 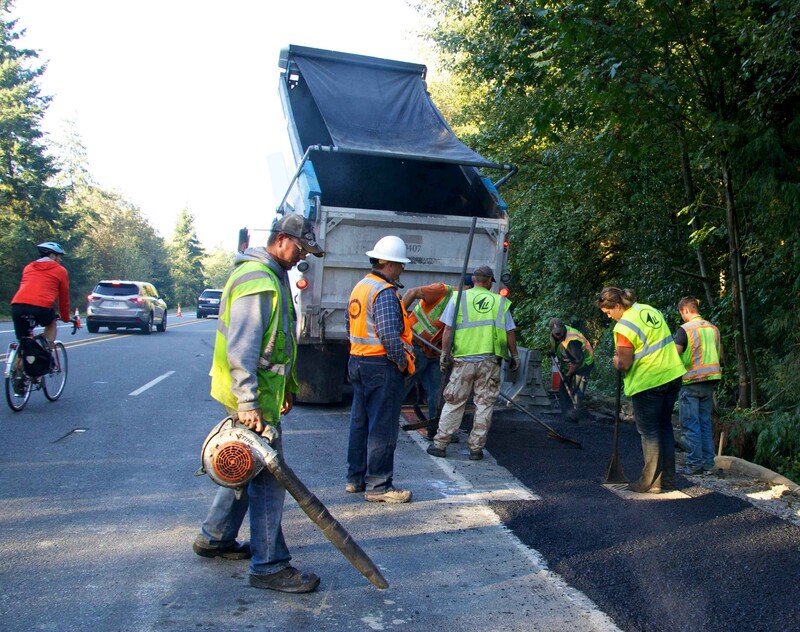 Removing this hazard area has been a high priority for a number of community groups, including the COBI Non-Motorized Transportation Advisory Committee, Squeaky Wheels, Go Bainbridge, and the North Kitsap Trails Association. The project complements the Sound to Olympics Trail/ SR 305 Corridor Improvement Project Phase II, which is in design now for the section between Winslow Way and High School Road. A portion of STO between Winslow Way and Vineyard Lane will be constructed in 2015. 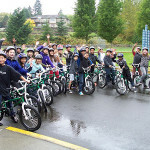 The “Phase II” grant for the STO is funded by a Transportation Alternatives Program competitive grant awarded to COBI by Puget Sound Regional Council, with match by the City. 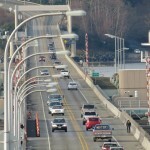 This article was posted in Advocacy, Guest Blogger, Infrastructure, Kitsap County and tagged Bainbridge Island. Bookmark the permalink. Follow comments with the RSS feed for this post. Both comments and trackbacks are closed. Is there a project page for this? This is great! Now if only Bainbridge would deal with the bike lanes that just randomly end (Wyatt Way NW comes to mind…). Every city has some of this kind of problem! We keep working to get more funding for bike infrastructure to get more complete connections.